Persistence Market Research presents a comprehensive analysis of the global proton therapy market in a new publication titled ‘Proton Therapy Market: Global Industry Analysis and Forecast, 2016-2024’. In this report, Persistence Market Research has focused on offering detailed insights and in-depth research on the global proton therapy market over an eight year forecast period 2016 – 2024. The report covers the important factors driving the expansion of the global proton therapy market, untapped opportunities for market players in this field, trends and developments shaping the dynamics of the global proton therapy market and other insights across various key segments. In addition, the report highlights the key drivers and restraints affecting the development of the global proton therapy market. Changing trends are also analyzed and incorporated in the report to equip the reader with exhaustive information about the global proton therapy market resulting in better decision making. Macroeconomic factors that directly and indirectly affect the growth and performance of the global proton therapy market are also incorporated in the report. This report covers the global proton therapy market performance in terms of revenue contribution. The report includes key trends, drivers, restraints, and opportunities influencing the growth of the global proton therapy market. Impact analysis of key growth drivers and restraints based on the weighted average model is included in this report to better equip clients with crystal clear decision-making insights. In the final section of the report, the global proton therapy market competitive landscape is included to provide report audiences with a dashboard view on the basis of categories of providers across the global proton therapy market and key differentiators. The forecast presented in this report assesses the total revenue of the global proton therapy market. When developing the market forecast, the starting point involves sizing the current market, which forms the basis of how the global proton therapy market is anticipated to take shape in the near future. Yearly change in inflation rate has not been considered while forecasting market numbers. Top-down approach has been used to calculate the market size, while bottom-up approach by therapeutic areas has been used to counter-validate the estimated numbers in the global proton therapy market. Indicators such as R&D expenditure, research funding from government and non-profit organizations, etc. have been considered to arrive at the estimated market numbers. The report also takes into consideration year-on-year growth to understand the predictability of the market and to identify the right opportunities across the global proton therapy market. As previously highlighted, the global proton therapy market is split into various categories. All these segments have been analyzed in terms of basis point share to understand individual segments’ relative contribution to market growth. This detailed level of information is important for the identification of various key trends likely to emerge in the global proton therapy market. The report also analyzes the global proton therapy market based on absolute dollar opportunity. This usually overlooked while estimating the market forecast. However, from a market perspective, it is essential to identify absolute dollar opportunity to identify potential resources in the global proton therapy market. Furthermore, Persistence Market Research has developed a unique market attractiveness index to understand the key segments in terms of their performance and growth in the global proton therapy market. This market attractiveness index would help clients identify real market opportunities in the global proton therapy market. Proton therapy involves radiation devices having accelerated protons as a source of radiation. Proton therapy is used to kill all the viable cancer cells. In proton therapy particle accelerators are used to target the tumor with a beam of protons. The protons are charged particles that interfere with the DNA of the cells thus damaging them leading to cell death. Proton therapy devices are costly space consuming equipment that comprises accelerator, electro-magnets, gantry, nozzle and patient room. In this report Persistence Market Research has categorized proton therapy devices into two types, namely single room center and multi room center. The single room center includes a proton therapy device equipped with only a single patient room whereas in case of multi room center a single proton therapy device is equipped with multiple patient rooms so that two or more patients can be simultaneously treated. The global proton therapy market has been segmented on the basis of set up type, indications and regions. The global proton therapy market is projected to expand at a CAGR of 15.2% during the forecast period in terms of value. The global proton therapy market is estimated to be valued at nearly US$ 1,100 Mn in 2017 and is expected to reach nearly US$ 3,000 Mn by the end of 2024. Growth of the global proton therapy market is mainly driven by increasing healthcare expenditure, increasing preference for advanced therapies by healthcare physicians, increasing adoption and increasing cancer prevalence. Another prominent growth driver is the faster uptake and access along with premium pricing. Moreover, reimbursement rate, adoption rate and product pricing will define the future landscape of the global proton therapy market. However, pricing can become a deterrent in the global proton therapy market, especially when it comes to affordability of proton beam therapy devices by small hospital setups. 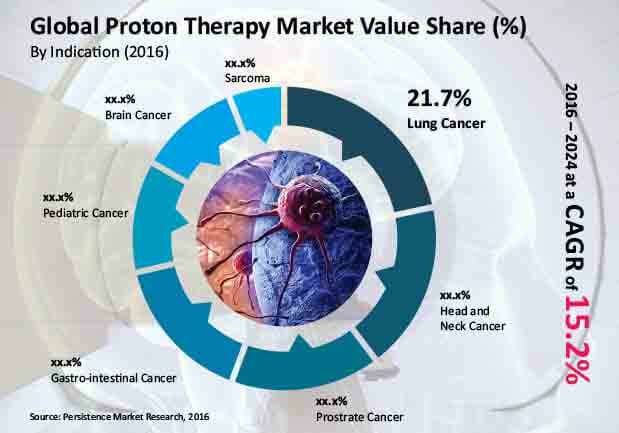 Based on application, the global proton therapy market is further segmented into Head & Neck cancer, Brain cancer, Sarcoma, Pediatric cancer, Gastro-intestinal cancer, Prostrate cancer and Lung cancer. Proton therapy applications are more inclined towards gastro-intestinal and lung cancer due to recommendations by healthcare professionals. Moreover proton therapy is also considered to be comparatively safer in case of pediatric patients suffering from cancer. These applications are expected to drive the sales revenue for proton therapy devices over the forecast period. Lung Cancer indication segment is expected to be the most lucrative in the global proton therapy market with a market attractiveness index of 1.5. Gastrointestinal Cancer indication segment is projected to represent a market attractiveness index of 1.1. Sarcoma and Brain Cancer indication segments are forecast to represent a market attractiveness index of 0.8 and 0.4 respectively. Pediatric Cancer and Head and Neck Cancer indication segments are expected to represent a market attractiveness index of 0.8 and 1.3 respectively. Proton beam therapy devices are very large in size, and hence require a large space with dedicated area. The setup cost is exclusive of the device cost, which further adds to the total costing of the project. Hence allotting a large area for the device setup in the very close vicinity of a hospital becomes difficult to manage. This restraint is expected to hinder the sales growth of the global proton therapy market over the forecast period.